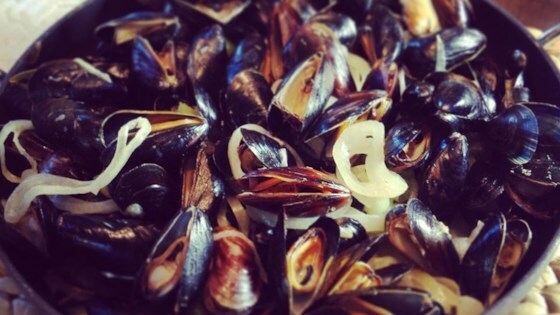 "A simple recipe for mussels typical mussel recipe from the Breton coast in France. Creme fraiche is available in many supermarkets, but if you cannot find it, a mixture of sour cream and Neufchatel cheese will also work. Serve with a dry white wine." In a large frying pan, melt the butter over medium heat, and cook until it is just beginning to turn brown. Add the onions and celery to the pan, and cook just until the onions are clear. Place mussels in pan, and stir. A few minutes after the mussels start releasing their juice, pour wine over them. Add the sprigs of thyme and the bay leaves; stir, then add salt and pepper. Continue to cook for about 10 more minutes, stirring frequently. Once all of the mussels are open, stir two large spoonfuls of creme fraiche into the sauce. Divide mussels and sauce between four bowls, and add a bit of parsley and another very small spoonful of creme fraiche for decoration. This was the first time I cooked or ate mussels and it was great! !...Even my (initially skeptical)family loved it a lot!! Excellent recipe. Used sour cream and cream cheese instead. This was a great recipe. The only thing I changed was using garlic butter instead of normal as it added a nice change to the flavour. TRhanks for the recipe. Wonderful recipe. I added two cloves of garlic, minced, sautéing 1 minute before adding the mussels. I also substituted heavy cream for the crème fraiche. So easy and so delicious. Fabulous recipe. Added a little zip with some cayenne, but otherwise just perfect. The sauce is to die for...have lots of break on handy. So easy and simple and yet, Fantastic! I like how i got to drink the wine with the meal and paired so well! (of course) I just stuck to the recipe and did not change a thing! Absolutely perfect. I live in Belgium where the mussels are served at nearly every restaurant, and I must say, these were on par with some of the best that I have tasted.